I always felt that I connected with Leslie Knope on a spiritual level. When I got to college, this connection was confirmed. 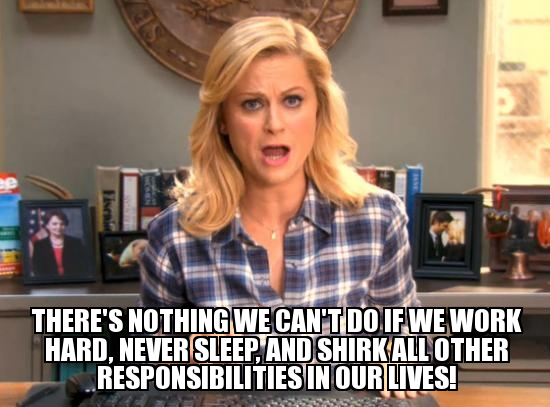 I think the majority of students can also relate to these Leslie Knope quotes that completely nail the college experience. Between studying, hanging out with friends, watching Netflix, and the having class every morning, it's physically impossible to get enough sleep every night.This is where caffeine comes in clutch. Is it just me or do you feel even more tired the day after you actually get 8 hours of sleep? I may have wasted many nights here, but I will continue to waste even more. To be honest, I haven't even SARTRED to read that. It doesn't matter how old I am - when a boy likes me, I turn into middle school me again. I mean, it may be useful when it comes to paying taxes and budgeting, but I don't need to take any derivatives to do those. You gotta butter them up. You gotta try two slabs of butter the second time. But, I swear, I do some of my best work at the last minute. Cram studying is better than no studying! They are really, really hard and I have no idea what is happening but I will still tell everyone: "They are good!" Staring at study guides and notes drives me into delirium real fast, to the point of me making absolutely no sense. I probably eat cereal for dinner at least three times a week. Sometimes I really just can't eat dining fall food. I can't live on cereal and trail mix forever, and nothing beats a home-cooked meal! Along with finals comes a lot of stress and anxiety... and sometimes tears. I'm not thinking about anything school related for the next month. I am OUT! For my Communication class, we were told to read a book called "The Defining Decade" by Meg Jay PhD. Her words of encouragement and advice really stuck with me so I wanted to share a response to the "work" section of her book. Over the next week, I will be reading her book so I hope to comment on her other sections but as for now, here is my opinion on "Work". First of all, this book really stressed me out. A lot of the things presented in the book were core beliefs of mine that had been muddled in recents months of being away from home. By the first page of the introduction when she begins to speak on how people in our generations, specifically Kate, have begun to believe that 30's are the new 20s, I immediately agreed with her point. I have always been looking ahead and saw my 30s as being the year that my life would finally start to come together because 20 seemed so close and 30 seemed so far away. While I am eager to start my future, sometimes choosing a path doesn't always seem easy. When she mentioned how Kate never had her driver's license, I began to think I was really different from her. I do have a good relationship with my dad and I've been driving since I was 15. However, what made me realize i might be similar was what she quoted from Socrates "The unlived life is not worth examining" (pg. xix) I realized there are so many paths, I could take but there's only really one with a few side streets and cultasacks that I'm supposed to take. While I'm sure what that path may be, I know it's out there. I really did resonate with Kate and how she felt that her friends were always moving faster than her. I was the last of my friends to have their first kiss and quite honestly, I've always felt behind in the boys department. I think that really does scare me because I don't want to be 50 and wondering why I'm not married but I think this book has put a lot of things into perspective that being your 20's is the best time put yourself out there whether it be for a job or even a nice boy who asks you out for coffee. I really liked the part when she talk about pop culture. When she referred to s17 year olds who act like they're 26 and 50 year old housewives that act the same, it really stuck with me. I thought of famous YouTubers such as Emma Chamberlain and how she is already living on her own in California, making millions of dollars and I haven't even moved out of my parents house or thought about or had a more serious job than lifeguarding. Pop Culture is what's molding the 30's to become the new 20's. People are so scared to take the leap because everyone is so focused on making a good living that any miscall job seems like the wrong way to go. The next quote that hit me hard was one that referred to hope. Meg Jay talked about this idea of optimism and how hope isn't always enough. She referred to a saying "Hope is a good breakfast but a bad supper". The way I took this was that being optimistic is enough to get your foot in the door but it isn't going to get you that far. It's like a car. Turning it on is a start but you have to put your foot on the gas to make it go. The next person was Helen. Helen's story made me laugh because the first thing it mentioned was her parent's dreams for her to be in Tri-Delt. That was my dream coming into college but here we are in April and not even in a sorority, let alone Tri-Delt. She used Helen as an example to bring up Identity capital. Identity capital is our collection of personal assets. I really liked this because it made me think about my individual strengths and what is that I'm good at. It reminded of my yoga class and how she told us to be grateful for one thing about ourselves and she said it could our health, or our body or our heart as examples. I immediately picked my heart. It goes back to what she was saying about how now all identity capitals can be put on a resume but my future employers should know that I truly have a big heart. I really resonated with the quote she put at the beginning of the "Weak Ties" chapter, overall I think that was my favorite but the idea of how "Yes is how you get your first job, and your next job, and your spouse and even your kids." It was crazy to think about how true that really is. You say "I do" as an affirmation that you want someone and it's the same as how you say yes when accepting a job. "Yes" is the leap you want to take. She talked about this idea of an urban tribe and how the people you are closest with actually slow you down. SHe didn't directly say this but it reminded of how my friends at school aren't as driven as myself and how sometimes I fall into their old ways. When she talked about Cole and Betsy. I thought that was really inspiring about they just met by random and she became the reason that he found his drive again. While I am a sucker for a good love story, I found it amazing how someone he barely knew was the one who got him back on his feet. It reminded me of how when I was upset about my dad having cancer, I found it a lot easier to tell people outside of my inner circle for some reason, my weak ties. The about unknown thoughts also really scared me. I feel like I have a better clue with what I want to do with my life compared to Ian but I still see some of my dreams as impossible. That tends to set me back a lot. While I have a dream to be a Broadway star, I took the Communication route because my love of writing is just as strong but a lot more practical. However, even with that, I fear that I won't get a dream job. I won't work for the magazines that I want to and I will end up in the ocean right next to Ian with no sight of land. Talia reminded me a lot of my friend from home who has been struggling at school. Coincidentally, she also reminded of a piece of advice that my other friend Grace gave me. Talia was in tears about the fact that her life wasn't as fabulous as she thought it would be. My best friend got into her dream school and cried about it. She was so happy to go but she got there and hated it. Now, she is so consumed with this idea of appearing that she's thriving because of the fear of "what happens if she's not?" Facebook lives should look better because of what my other friend grace told me. Everyone is going to try to convince that they're doing better than are because that's how our generation works. You post on Instagram to get attention and make it seem like you're doing better than you did in high school. When Meg Jay talked about the Facebook weddings where people choose their pretty friends over their best friends, I really felt this. I am not on a lot of my best friend's Instagrams because the pictures we take together aren't as good as the pictures they happen to look a little bit better in with acquaintances. The Customized Life talks a lot about what I said before. There's only one path for me. However, the line that stuck with me was "That you can't pull some great career out of a hat in your thirties. You've got to start in your twenties." I found this to be really shocking. It felt like one of those moments where the author is yelling directly at you even though you know they're not. It just reminded me that I really need to go after what I want and branch out. I really liked the part about hte custom bike that Ian has and how he started with ordinary parts that all bikes need but eventually customized it to make it special for him. It reminded of how We start college by taking general education courses but eventually customize ourselves so we're ready for the jobs we'll go after when finally graduate. Overall the first section of this book really scared me. It made me think about what is that I want to do and how I don't have that much time before they shoot that gun and me and every other graduated senior have begun the race, ultimately competing at life.